1. Roast the tomatoes on the gas flame and peel away the skin after cooling. 2. Heat oil in a pan. Add garlic, ginger and saute until brown. 3. Add the onions and fry until they are brown in colour. 4. Add the roasted and peeled tomatoes, salt and spices. Fry until the oil separates. 5.Now tip in the potato pieces and stir fry. Cover and let them cook. 6. Add the blanched and pureed spinach and mix well. Simmer to cook until done. I'm so glad that you liked the preparation. Even I love to experiment with spinach. Thanks for trying my recipe and linking it to the event. The curry looks awesome, Shobha! 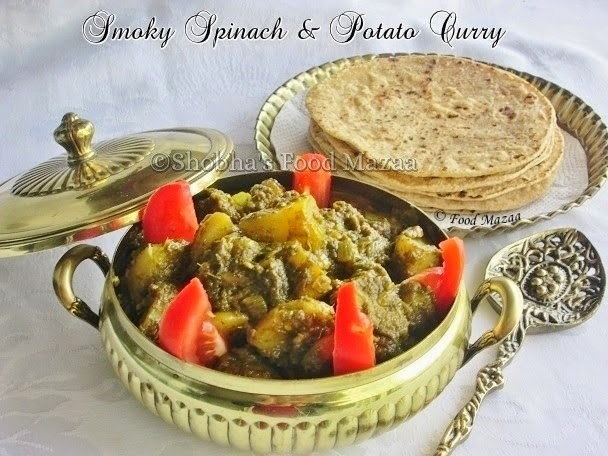 I love smoky flavor in curries, this spinach potato curry is too delicious, will give a try soon. Must be yummy with smoky smell.will try somtime. This looks delicious! I love the click and specially the serving bowl..